Brian Kissel announced this morning that PayPal has joined the board of the OpenID Foundation as our sixth corporate member, with Andrew Nash, Sr., Director of Information Risk Management and a longstanding advocate for OpenID, as their representative. That PayPal has joined is certainly good news, and helps to diversify the types of companies sitting on the OpenID Foundation board (PayPal joins Google, IBM, Microsoft, VeriSign and Yahoo!). It also provides a useful opportunity to think about how OpenID could be useful (if not essential) for financial transactions on the web. For one thing, PayPal already relies on email addresses for identification, and one of the things that I’m strongly advocating for in OpenID 2.1 is the use of email-style identifiers in OpenID flows. From this simple addition to your discovery profile, third parties would be able to request authorization to payment, without necessarily having to ask you every time who your provider is. And of course no payment would be disbursed without your explicit authorization, but the point is — sellers would be able to offer a much more seamless payment experience by supporting OpenID and discovery. The pieces are more or less in place here, and with PayPal on board, I think that we’re starting to see how OpenID can be used to smooth the on-boarding process for any number of routine tasks — from specifying where you store your photos to pointing to the service(s) that you use for payment. I commonly use the metaphor of credit cards for OpenID. One thing that makes credit cards convenient is that the 16-digit unique ID on each card is embedded in the magnetic strip, meaning that it’s trivial for consumers to just swipe their cards rather than typing in their account number. OpenID and discovery, combined, provides a similar kind of experience for the web. I think we need to keep this in mind as we move the state of the art forward, and think about what can be accomplished once people not only have durable identity on the web — but can use those identifiers to access other forms of real-world value (and can secure them however they see fit). I have long been involved with the OpenID community and have advocated for its adoption ever since I discovered it. It is a central building block of the emerging Open Stack and of the DiSo Project, an effort that I co-founded to create reusable components for decentralized social networking. 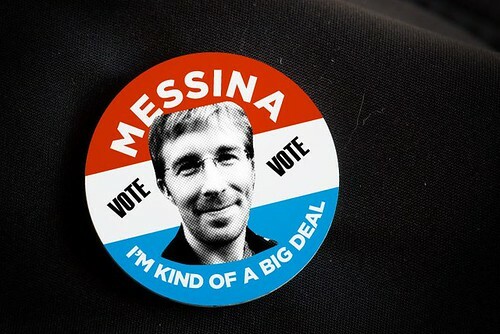 To get right to it: I’m running for a seat on the OpenID board because I believe that there is a need for change, for evolution, for setting a clear direction, and a need for a passionate rededication to the promise that OpenID represents. Above all else, I also believe that the OpenID brand needs to be strengthened to mean something specific, in the same way that brands like Visa and Mastercard now, many years after their introduction, indicate the ability to use an abstract identifier (like a piece of plastic) to access something of value (namely, your accounts). In the case of OpenID, for some, it may mean connecting with friends or pulling in photos or bookmarks from one’s favorite services. It may also simply mean not having to get another password, or it might provide a more convenient way to identify yourself. But bottom line, the Foundation needs to see through OpenID becoming a strong and recognizable consumer brand. 1) I believe that we must make OpenID more usable, but I also believe we must enhance the value of having an OpenID in the first place. Single sign-on is not enough. Facebook Connect demonstrates real value for both relying parties and for Facebook account owners; OpenID must mean more to people than one less password — it has to be seen as a vehicle leading to the socialization of the web in a way that’s meaningful, durable, and that enhances individual choice — and therefore, freedom. 2) Over the past year, we have chalked up high level support from such companies, and though their support is invaluable, we must continue to increase our visibility and credibility by consistently becoming more inclusive, more diverse and more expansive in our reach. The OpenID community needs to organize itself as an ally to developers, designers, relying parties, businesses, governments, municipalities, and educational institutions, and move beyond the emphasis on large internet companies. a) To this end, I believe that the Foundation should commission an ongoing series of general user studies on trends in online identity management and conduct surveys on OpenID brand awareness, OpenID usability, virtual identity internalization, and online social behavior. The Foundation should endeavor to become an authoritative source of knowledge, understanding and best practices for creating identity solutions for people on the social web. b) Personally, I would like to improve the state of the OpenID web site and use of social media. I’ve done quite a bit of work marshalling communities with social software and am happy to take on such responsibilities. c) I also believe that further progress must be made to harmonize OpenID and OAuth, and that the work that Google has spearheaded in this regard is critical. d) I would like to centralize the OpenID libraries, either on Google Code or GitHUB, and through the existing bounty program, incentivize the development of optmized language-specific libraries, as we have done with the OAuth community. This effort would be incomplete without the development of a test suite and series of test servers against which various libraries and implementations could be tested. a) To do this, we must develop 21st century trademark guidelines, as Mozilla has, that enable us to maintain the integrity of the name and the mark, while also supporting widespread publishing and promotion of the mark, through non-commercial grassroots communities and networks, just like the Firefox brand. As a former community admin of the Spread Firefox project, I can confidently lend my experience here. c) There is a need for more decentralized *camp-style events that promote solutions built on Open Stack technologies like OpenID, and we need to increase our presense and marketing materials at popular trade events both within and beyond the web community. I have proposed to O’Reilly a full day of workshops at the upcoming Web 2.0 Expo event in San Francisco and have initiated a conversation with Wired to develop a series of tutorials for their Webmonkey How-to wiki. We need to move beyond web-based outreach and marketing and start encouraging involvement in OpenID from folks in the real world. d) Along with improving OpenID in desktop contexts and mobile devices, I think that OpenID can become useful in console gaming situations, just as people have become used to the idea of Wii Codes and Xbox gamertags (why aren’t those OpenIDs?!). OpenID is at a critical juncture, and with the right people involved, the OpenID Foundation and its supporters will usher in the future of the free and open social web. Recent conversations have convinced me that the role of the boardmember brings with it a certain visibility, responsibility, and an opportunity to lead from within that would provide me with a platform to be more effective and to realize my aspirations for OpenID more quickly. I am also impressed by the caliber of individuals running for the board (though I would have preferred to see a more diverse pool of candidates, since OpenID isn’t only used by male internet users). And to put my candidacy in context, I want to make it clear that I will continue to advocate for and advance the cause of OpenID whether or not I am selected to the board. Nominations close on Monday and I need at least two seconds to be eligible to be voted on. Voting begins on Dec 10 and ends Dec 24, with the results of the election being announced by Dec 31. Now, this is a story all about how My life got flipped-turned upside down. And I liked to take a minute Just sit right there, I’ll tell you how I became the prince of a town called Bel Air. In west Philadelphia — born and raised. On the playground was where I spent most of my days Chillin’ out, maxin’, relaxin’, all cool and all shootin some b-ball outside of the school, when a couple of guys who were up to no good startin making trouble in my neighborhood. I got in one little fight and my mom got scared She said ‘You’re movin’ with your auntie and uncle in Bel Air’. I begged and pleaded with her day after day, but she packed my suitcase and sent me on my way. She gave me a kiss and then she gave me my ticket. I put my walkman on and said, ‘I might as well kick it’. First class, (yo this is bad), drinking orange juice out of a champagne glass. Is this what the people of Bel-Air living like? Hmmmmm this might be alright. But wait I hear they’re prissy, wine all that. Is Bel-Air the type of place they send this cool cat? I don’t think so I’ll see when I get there I hope they’re prepared for the prince of Bel-Air. Well, the plane landed and when I came out there was a dude who looked like a cop standing there with my name out. I ain’t trying to get arrested, I just got here! I sprang with the quickness like lightning, disappeared! I whistled for a cab and when it came near, the license plate said fresh and it had dice in the mirror. If anything, I can say this cab is rare! But I thought ‘Nah forget it’ – ‘Yo homes to Bel Air!’ I pulled up to the house about 7 or 8 And I yelled to the cabbie ‘Yo homes smell ya later’ I looked at my kingdom I was finally there to sit on my throne as the Prince of Bel Air.